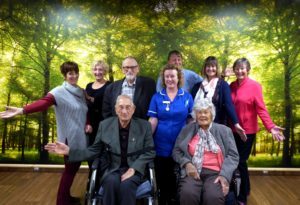 Visitors to North Walsham hospital’s day room can take a trip back in time or into a leafy woodland glade thanks to the efforts of its Friends and public generosity. North Walsham War Memorial Hospital Day Room revamp. Friends and ward sister Kerry Howarth by the new woodland wall mural. Picture; Richard BatsonA £20,000-plus revamp of the room at War Memorial Hospital has just been completed. 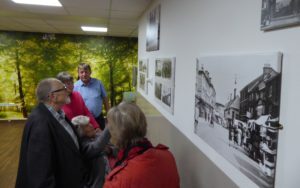 It features a full wall forest mural and a selection of archive photos showing the historic hospital and the town centre. It was paid for using donations made to the hospitals League of Friends, who provide “extras” that are beyond the health service budget. Friends members got a glimpse of the room’s facelift after their annual general meeting. Chairman Keith Jarvis said: “We hope the room will provide a homely, relaxing place for patients and their families to spend time together. North Walsham War Memorial Hospital Day Room revamp. Hospital Friends look at the display of archive pictures. 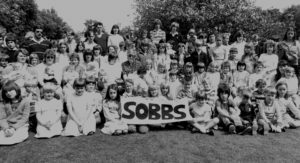 Picture: Richard BatsonThe archive pictures – a selection of which are below – were provided by the North Walsham and District Community Archive. North Walsham War Memorial Hospital Day Room revamp. Save Our Baby Beds campaign 1985. Picture; North Walsham and District Community Archive. North Walsham War Memorial Hospital Day Room revamp. 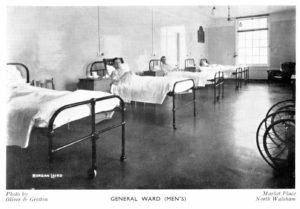 Archive pic of a ward in the original hospital. Picture: North Walsham and District Community Archive. North Walsham War Memorial Hospital Day Room revamp. 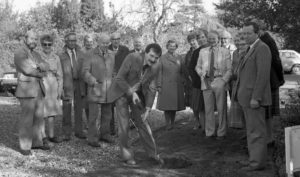 Archive pic of 1984 tree planting by the Friends, led by chairman Brian Elliott. 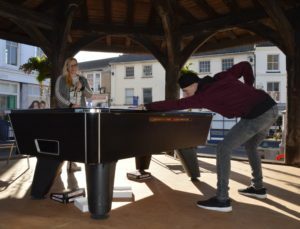 Picture: North Walsham and District Community ArchiveThe project also includes a new television, blinds, flooring and furniture. It is also planned to renew furniture and provide raised flower beds in the garden patio area outside the day room, for people to enjoy in good weather. A formal opening of the new-look day room will be is planned in the coming months. During the previous year the Friends received £2354 in donations and £2280 in lieu of flowers at funerals, the annual meeting heard. The group spent around £11,000 on buildings and equipment ranging from soundproofing a training room to a microwave oven and fan. The Friends also organise Christmas carol singing and gifts. Chairman Keith Jarvis, secretary Angela Batson and treasurer Carol Willgress were re-elected at the 69th annual meeting. 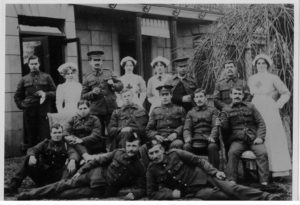 Mr Jarvis reported that the Friends had also helped provide replica flags to remember the town’s two First World War Red Cross hospitals which nursed injured troops. 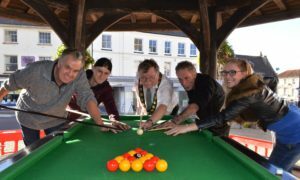 They were also pleased to be town mayor Barry Hester’s nominated civic charity this year. For other archive pictures – and updates on the Friends work – also see our Facebook page. Faded flags that flew over wartime hospitals are set to “fly” again thanks to a friend of the current care complex. They once marked the location of two temporary First World War hospitals in North Walsham where the Red Cross nursed injured troops. Today the white and red pennants have turned grey with age, and languish in the parish church where they have been stored for years. But a joint initiative between the vicar and the Friends of North Walsham War Memorial Hospital is providing replicas to remind people of the town’s nursing heritage. 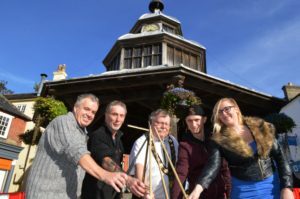 And it has been made possible by a donation from a well-known local shopkeeper and musician with connections to both organisations. 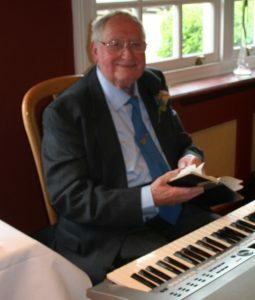 A collection in memory of musician Denis Payne, who died in November 2016 aged 86, is being used to provide two £300 replicas for the church where he used to play keyboards at funerals, and where he gave visitors tours of its history. And the Friends organisation is buying one to put in the hospital which cared for Mr Payne, who ran the family sweet shop in town for many years, when he was ill in later life. The church flags will go in the war memorial chapel which honours the 99 men who served their country but did not return home. The Rev Paul Cubitt said it was fitting to get the flags revived for 2018, the centenary of the end of the Great War. 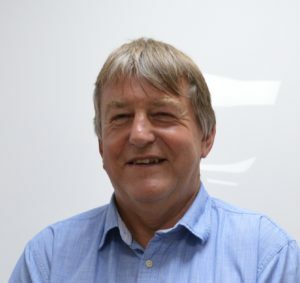 “We are really grateful for the Payne family for donating the money in memory of Denis to make this happen,” he added. Both Red Cross auxiliary hospitals were on Mundesley Road. One, Wellingtonia, is now a private house. 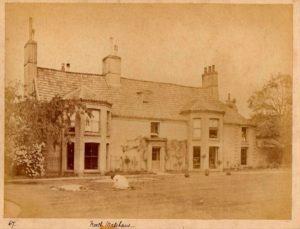 The other, Lower House, was demolished and is now Greenway Close. The modern complex was opened in 2012, on the site of the former 1924 hospital which was built in memory of the 1914-18 war victims. If you would like to help the Friends with a donation call chairman Keith Jarvis on 07788 889853. The church is fundraising to restore its main east window over the high altar which is also a Great War memorial. To help with the church window appeal contact the vicar on revpcubitt@btinternet.com. 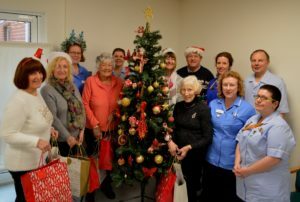 Patients spending Christmas in hospital at North Walsham were given the tonic of extra gifts to unwrap – with a little help from their Friends. Hospital Friends members deliver gifts to patients at Christmas. Parcels of goodies were delivered to wards at North Walsham War Memorial Hospital on the weekend before the big day. Bearing the gifts were members of the hospital’s League of Friends which does the annual present-drop using funds generated by public donations. The packages were presented to 27 patients as the hospital was fully-occupied over the festive period. 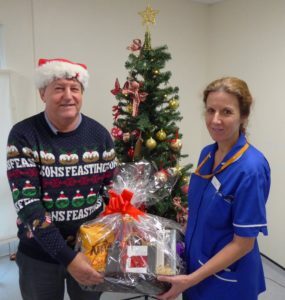 Hospital Friends chairman Keith Jarvis hands over a hamper gift to staff. The Friends, who also organised a visit by carol singers over the festive period, presented hampers to the staff as well. The support group of volunteers provides extras all year round however, and are currently drawing up an action list of projects for 2018, including a new website to keep the community in touch with their work. If you would like to help the Friends with donations or fund-raising please contact Mr Jarvis on 07788 889853.